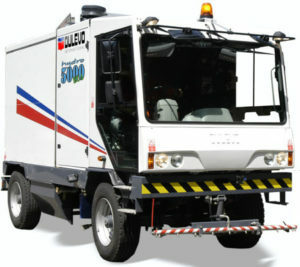 The Dulevo 5000 Hydro is the latest answer to urban street washing and disinfecting requirements. The four wheel steering system and the compact dimensions ensure excellent maneuverability. A large 6,000 liters capacity allows longer working periods between refills, thereby increasing productivity. Designed to ensure maximum levels of operator comfort, the cab is completely insulated with sound deadening materials, lightly pressurized and is equipped with two seats.